Parkinson’s is a progressive, neurological disease. It causes deterioration of motor function by a decrease in healthy dopamine levels in the brain and destroys nerve cells in a specific region. It mainly affects physical movement, but can also affect cognitive function. Common symptoms of Parkinson’s include tremors, rigidity and stiffness, slow or loss of movement, as well as balance and walking problems. Often, one side is affected more than the other, but can gradually progress to both sides. In the progression of Parkinson’s, those affected often lose their reflexes. This is called retropulsion. You can see this as they sway backwards when turning or standing up from a seated position. Additional symptoms may include anxiety and restlessness, difficulty writing, excessive sweating, urinary urgency, sexual problems, and dystonia of eyelids. Do your research. Alongside the information provided in this specific post, do your research on Parkinson’s so as to be as educated and prepared as possible. Staying up to date with the changes and progression of the individual you’re caring for is important, too. Accompanying them to doctors appointments and asking questions will give you a great deal of information not only on the disease, but information relevant to the person you’re caring for. Taking into account the research you’ve done and what you may know about the individual concerns, carefully consider and plan in these areas: yours and their perceptions and opinions, the home and environment, as well as the financial status and future planning. Sitting down together to find common ground and a mutual understanding of what is needed can make things much easier down the road. Talking to an experienced caregiver or joining a support group can help guide you in the right direction, answer any questions you may have, as well as help you feel less alone. Confiding in someone that has cared for or is caring for someone with Parkinson's can relieve any of the mental stress you may feel from caregiving. Caregiving may seem like it’s a one-person job, but it isn’t meant to be done alone. It’s a tough and challenging job. Asking for help is possible in many ways; community outreach programs like Meals On Wheels, adult day care, or different offerings by senior centers. Other resources like social workers and health care providers can provide you with help, assistance, and the information you may need. Usually for a fee, there are services provided for help with things like cooking and bathing. You can also find help from neighbors and friends, churches, and synagogues. This might be the most important one of all, but most definitely not the easiest. As a caregiver, it’s easy to get caught up in your job - caregiving. But it’s important to remember to take care of yourself and prioritize your mental, emotional, and physical health. This can be achieved by remembering the last tip: ask for help. Taking breaks and time off with the help of others and/or services will allow you time to recharge and reset to be able to continue to take on the role of caregiver. Remember to manage and prioritize your own health; exercise, eating well, sleeping enough, staying socially active. Time spent enjoying yourself, your family and friends, and even a job will help keep you balanced so as to be the best possible caregiver you can be. Upkeep on the relationship you have, beyond simply holding the roles of caregiver and one receiving the caregiving, by maintaining healthy communication and reevaluating your circumstances can make a significant and positive impact on the situation. Although it is difficult, remember that it is a solid foundation that can help you both immensely. There is research showing that caregivers with quality and healthy relationships have reduced depression and better physical health, despite all of the challenges and strain that may be experienced. 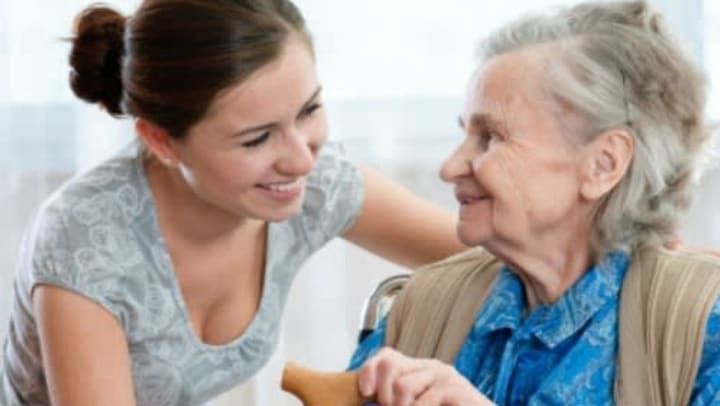 It is important to always remember that your role as a caregiver is much more than a title, it is a service of genuine compassion, love, and concern. Sometimes, caregiver gets to be too much for someone to handle, and that is okay. We have some great resources for the types of senior living communities and facilities that are offered to better help you understand your options, as well as helpful information on Parkinson’s and Assisted Living, a step-by-step guide to making the transition. Americare is dedicated to helping you every step of the way, if you have further questions or concerns, you can speak with one of our eldercare advisors at 573-544-0745.